Review: It would be fair to say that very few people - in Europe and the U.S at least - know much about the Egyptian music scene of the 1960s. This compilation, then, should be something of an eye-opener to all of those with an interest in musical movements from around the world. What's perhaps most interesting is the surprisingly "global" nature of the influences on show. 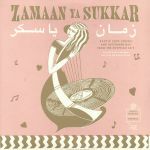 Check, for example, the jaunty bossanova rhythms underpinning Salim El Baroudi's "Fatouma", the humid Arabic jazz flex of Abd Al Fattah Mensi's "Leyla", the tango style accordions of Al Thourathy Al Mareh's "Asmar Ya Sukkar" and the wonderfully over-the-top easy listening orchestration that leaps out from Magda Ali's "Nafourak Ya Ghazal (A Nubian Love Song Part 1)". Tabu Ley Rochereau & Afrisa - "Introduction"
Tabu Ley Rochereau & Afrisa - "Celicia"
Tabu Ley Rochereau & Afrisa - "Annie"
Abumba Masikini - "Magali Ya Kinshasa"
Abumba Masikini - "Limbisa Nga"
Abeti - "Mobutu Praise Song 1"
Abeti - "Traditional Folk Song"
Abeti - "Mobutu Praise Song 2"
Franco & TPOK Jazz - "Introduction"
Franco & TPOK Jazz - "Nzoto"
Franco & TPOK Jazz - "Mosala"
Franco & TPOK Jazz - "Kasai"
Franco & TPOK Jazz - "Koni Ya Bonganga"
Franco & TPOK Jazz - "Balingaka Ngaite"
Franco & TPOK Jazz - "Mabuidi"
Franco & TPOK Jazz - "Instrumental Dance Chant"
Franco & TPOK Jazz - "Kizembike"
Franco & TPOK Jazz - "Lala Nzala"
Franco & TPOK Jazz - "Instrumental"
Miriam Makeba - "Mobutu Praise Song"
Miriam Makeba - "West Wind"
Orchestre Stukas - "Mobutu Praise Song"
Pembe Dance Troupe - "Pembe Dance Song"
Maroon 5 - "Don't Wanna Know"
Robbie Williams - "Go Gentle"
Years & Years - "Eyes Shut"
Jamie Lawson - "Wasn't Expecting That"
James TW - "When You Love Someone"
Black Uhuru - "Guess Who's Coming To Dinner"
Grace Jones - "My Jamaican Guy"
The Isley Brothers - "Work To Do"
Culture - "Holy Mount Zion"
Roots Radics - "Dedication To Dean Fraser & Nambo"
The Abyssinians - "Satta Amassa Gana"
The Heptones - "Book Of Rules"
Max Romeo - "War Ina Babylon"
Johnny Was - "Skip Marley"
Keith Christmas - "Forest & The Shore"
Shelagh McDonald - "Orphelia's Song"
John Cale - "I Keep A Close Watch"
Tim Hart & Maddy Pryor - "Dancing At Whitsun"
Vashti Bunyan - "Rainbow River"
Andy Roberts - "I've Seen The Movie"
Gillian McPherson - "It's My Own Way"
Steve Ashley - "Follow On"
Sandy Denny - "Silver Threads & Golden Needles"
Spirogyra - "Love Is A Funny Thing"
Gary Shearston - "Friend To Me"
Shirley Collins - "Honour Bright"
Richard & Linda Thompson - "First Light"
Ian Matthews - "Gimme An Inch Girl"
Dana Gillespie - "What Memories We Make"
Ralph McTell - "Pick Up A Gun"
Review: Following the liberation of Zambia from British colonial rule in 1964, a musical revolution took place in the Southern African nation. By the start of the 1970s, the country had its own unique fusion style known as Zamrock. A thrilling fusion of psychedelic rock, James Brown style hard funk and indigenous musical elements (most notably vocals and rhythms), the style was hugely popular in the nation throughout the decade. This superb double-vinyl compilation provides a brilliant overview for newcomers, gathering together scene staples and lesser-known gems from the likes of Witch, Ngozi Family, Ricky Banda, Machine Gunners, Salty Dog and Born Free. For the curious, the story of those who shaped the style is told in greater detail in the accompanying booklet.